Firearms History, Technology & Development: Carrying Magazines "Jungle Style"
In today's post, we will study a method of configuring weapon magazines, which is popularly called "Jungle Style". We will see what this is all about. Polish Soldier armed with an AKMS rifle. Click on the image to enlarge. Public domain image. 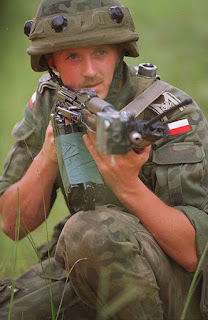 In the above image, we see a Polish soldier carrying an AKMS assault rifle. Notice that at the bottom of the rifle, there appears to be multiple magazines, which are held together by using some green tape. This is what carrying magazines "jungle style" is all about. The reason for the name is that the practice of taping multiple magazines together originated with US forces in the Pacific campaign and fighting in the jungles. US soldiers who were armed with the M3 Grease gun and the Thompson Submachine gun (a.k.a Tommy gun) in the jungles of Asia, needed a way to quickly change magazines, especially since early Thompson submachine guns only came with 20-round magazines. Some genius figured out that if multiple magazines were attached together with some sticky tape or rubber bands or clamps, the result is much easier and faster to change, as the new magazine is already attached to the old one. Since this technique was extensively used when fighting in thick jungles, this idea of taping magazines together began to be called "jungle-style" and the name stuck. In the beginning, many soldiers improvised by tying two or more magazines together with rope, duct tape, rubber bands etc. So many American soldiers attached magazines together for their M1 carbines that the US military took notice and introduced the "T3-A1 Magazine Holder", which was a metal clamp that could hold two 30-round M1 magazines together, without any tape. Later on, some companies (e.g. SIG, Heckler & Koch etc.) began to manufacture magazines with built in studs, so that multiple magazines could be stacked without using rubber bands or tape. A SIG 550 magazine. Click on the image to enlarge. 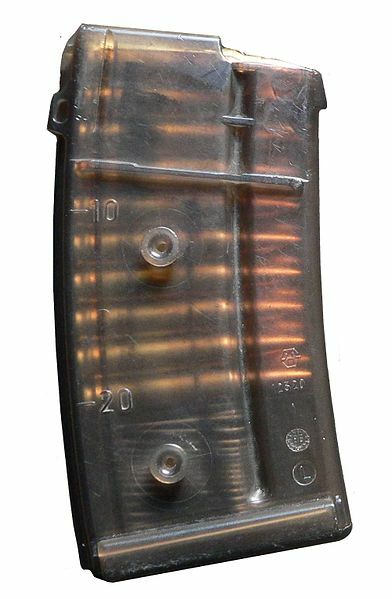 In the above image, we see a box magazine designed for the SIG 550 rifle. Note that the magazine has two protruding studs on the outside of the magazine. The other size of the magazine has two U-shaped slots to accept the studs. This design allows multiple magazines to be stacked side-by-side, without using any tape, twine, rubber bands or clamps. Carrying magazines "jungle style" certainly helps speed up the reloading process, as the loaded magazines are attached to each other and can be easily swapped out. On the other hand, they have a few disadvantages as well. For one, they alter the balance of a weapon. There is also an increased risk of weapon stoppages because while one magazine is inserted into the weapon, the other magazine lips are open and exposed to dirt and dust. Interesting, I was familiar with jungle clips but never knew the origin of the name. I saw some variations on the theme in Israel in the early 80s. For M16s there was a clip that held two 30 round magazines at the base in a narrow V shape to clear the magazine well and Uzis had a clip to hold the magazines in an L shape. 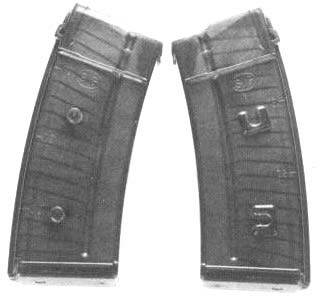 The Uzi clip was also frequently used to stick a magazine to the folding stock since most Uzis were carried unloaded. The post could use slight edit since you refer to M1 rifles when you meant M1 carbine. Fixed. Thank you very much for your feedback, Mr. Slow Joe Crow. Much appreciated :).